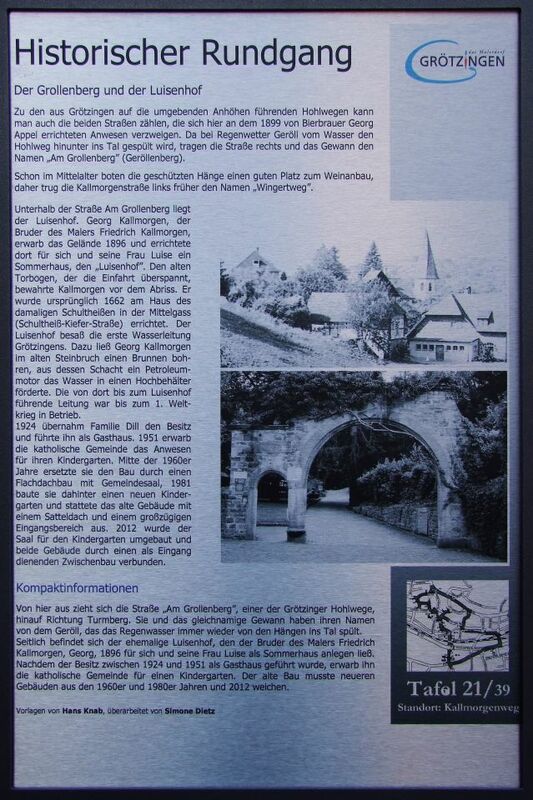 Leading from the surrounding hills Grötzingen Hohlwegen can also include the two roads that branch out here at the 1899 built by brewer Georg Appel property. Because down the ravine from the water when it rains debris is washed into the valley, take the road on the right and the Won's name "Am resentment Berg" (mountain scree). Already in the Middle Ages gave the protected slopes a good place to wine, hence the Kallmorgenstraße wore left formerly known as "Wingertweg". Below the street Am Grollenberg is the Luisenhof. Georg Kallmorgen, the brother of the painter Friedrich Kallmorgen, acquired the site in 1896, where he built for himself and his wife Luise, a summer house, the "Luisenhof". The old arch that spans the entrance, Kallmorgen saved from demolition. It was originally built in 1662 at the house of the then mayor in the middle Gass (Schultheiss Pine Street). The Luisenhof had the first water line Grötzingens. For this purpose, Georg Kallmorgen drill a well in the old quarry, a petroleum motor promoted the water in an overhead tank from its slot. The Luisenhof leading from there to the line was in operation until the first world war. 1924 took over the family Dill owned and led him as a guest house. 1951 acquired the Catholic community the property for their kindergarten. Mid-1960s, they replaced the building by a flat roof with community hall, in 1981, she built behind a new kindergarten and equipped the old building with a gabled roof and a spacious entrance area. 2012 room for the nursery was rebuilt and the two buildings connected by a serving as input intermediate building.